The following is a comprehensive glossary of all the Japanese terms you will find on this website relating to samurai armor, clothing and accessories crafted by the Iron Mountain Armory. 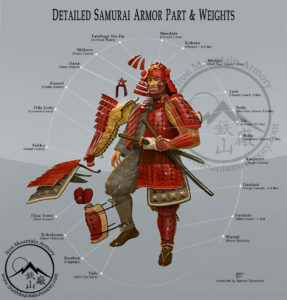 For quick reference with the names of basic Samurai armor parts, check review the illustration below! the scholars, partly from other sources and are more commonly used. They should not be regarded as definitive. 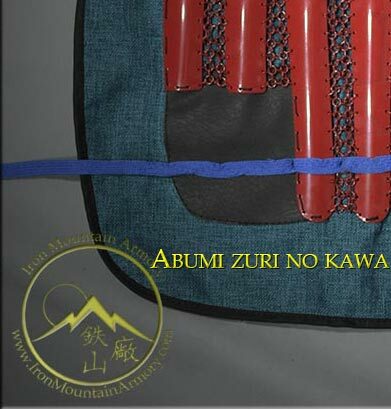 Abumi zuri no kawa A leather patch on the inside of tosei do shin guards designed to prevent chafing of the stirrup leathers. Agemaki A decorative cord which was tied into a special knot or "bow" and hung from rings on an armor. Said to look like a dragonfly, an especially large one was hung on the back as part of the shoulder guard attachments. Agemaki no kan A swivel ring fitted to the back of a do, from which a large agemaki is hung. Ago no o benri The protruding studs on the chin of a mengu (facial armor), designed to prevent the helmet cords from slipping forwards. Aida kanamono Decorative metal ornaments in the centre of a do or sode. Also refers to the metal fittings used to hold the kesho no ita in place. Akoda nari bachi A style of helmet which is distinctly swollen at the back and normally without prominent rivets, developed during the Muromachi period. Art Art is used as an abbreviation for "artificial"
Asa no ha gusari Mail in which each round link connects to two others by oval links. Bachi The bowl of a helmet in which the rests upon the head. 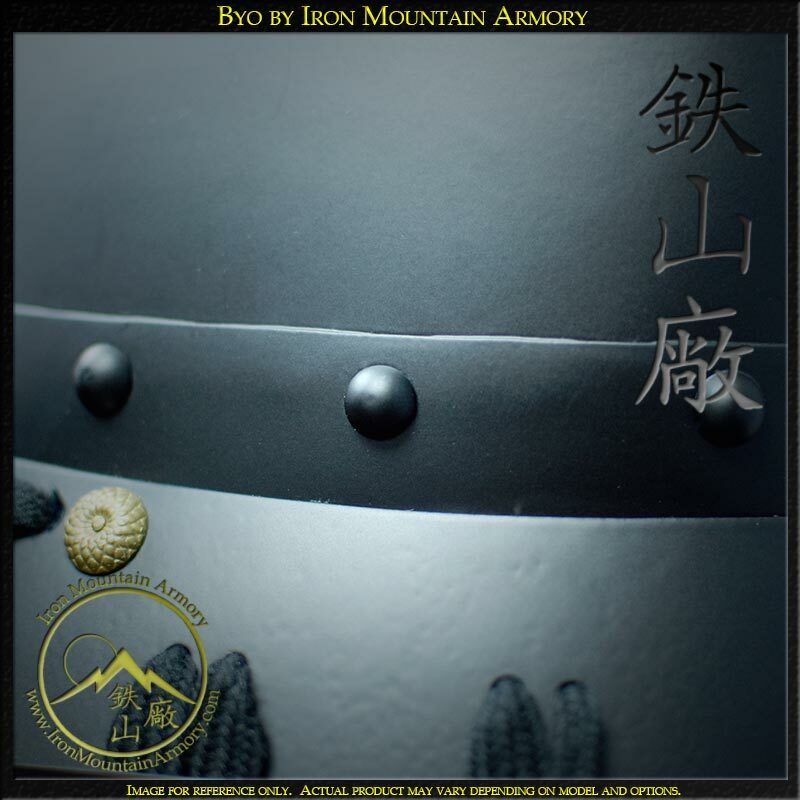 - Often referenced by Iron Mountain Armory as "Laminated helmet"
Bishamon gote Armoured sleeves that have a small, integral sode covering the upper arm. Boko no ita The top plate at the back of a tosei do, to which the watagami are riveted. Bitsu An armor chest, designed for suits of armor or helmets. Bugyo A Feudal Japanese magistrate. A mid-ranking samurai. Byo A rivet, either used to hold lames together or a decoration. Byo gashira The head of a rivet, often referring to the shape. Byo toji yokohagi okegawa dō A tosei dō consisting of horizontal plates, fastened by prominent, often decorated rivets. Chochin kabuto A helmet of separate horizontal rings that collapses like a folding lantern. Chotsugai Kugi A hinge pin. Daisha Guchi An erect, funnel like tube at the apex of some foreign bachi or those influenced by foreign bachi. Daimyō A governing warlord of a Provence. Dangaye Dō A tosei do in which different styles of lacing are used in the upper and lower sections. Dō A cuirass (chest armor), also written "dou" or "doh". Dō Maru Scale armour which wraps around the body and fastens under the right arm (see haramaki). Eboshi A tall cap of variable shapes and heights, often curving backwards at the top. Believed to imitate the plume of a particular bird. Eboshi Nari Bachi A helmet made to resemble the shape of an eboshi. Egawa Printed leather (hide) often decorated with a pictorial or geometric design. Emi men A mengu made in the form of a laughing face. Etchu bo A simple mask that covered only the chin and lower jaw. Etchu suneate Splint shin guards without a fabric backing. Etchu zunari bachi A helmet bowl of simple construction, in which the longitudinal top plate overlaps the brow plate. 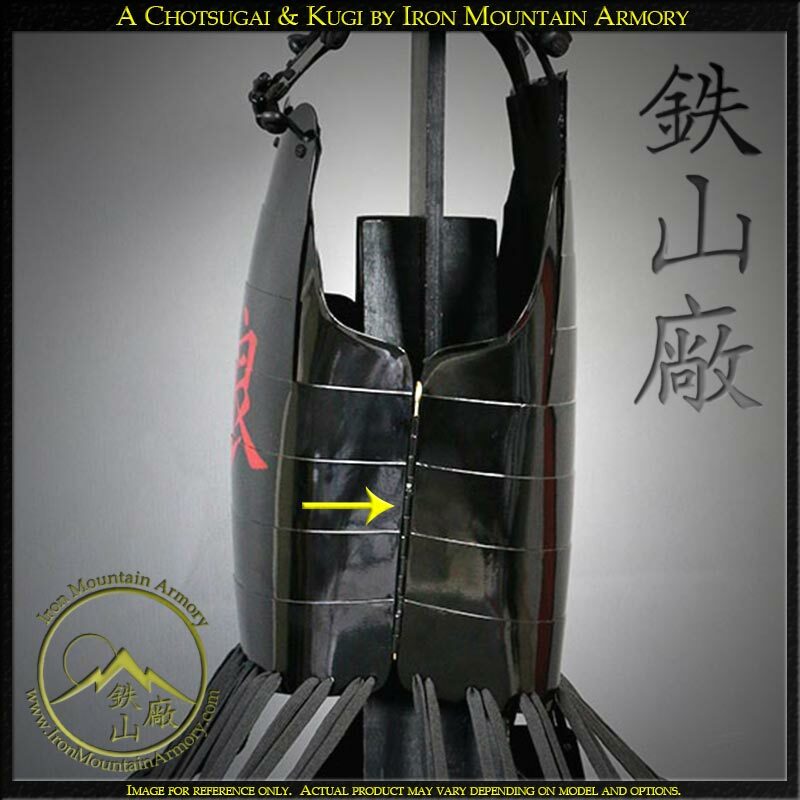 Fukigaeshi The turn back at the front edge of the upper row or rows of a neck guard. Sometime referenced as "ear" by Iron Mountain Armory. Fukube A gourd shaped plate applied to armored sleeves. Fukurin An applied, decorative metal trim around the outer edging of armor plating. Fuse Gumi Multicolored over-sewing used at the outer edging or junction of two different leathers. Fusube Gawa Smoked and/or treated leather with a yellow or brown color. Gashira A samurai, similar to a sergeant or officer in rank. Gattari An attachment for a sashimono (banner), fastened to the back of dō at the level of the shoulder blades. Gendai Technically, any item of armor produced after about 1868, but more commonly used to refer to pieces that have been made since the end of WWII. Translates as ‘modern’. Gessan Pendant shaped, armored sections attached to the lower edge of a tosei do. Equivalent to kusazuri on lamellar armors. hang in part, or entirely independently of each other. Go-Mai Dō A dō consisting of 5 sections - front, side, back and two half pieces under the right arm, all joined by hinges. Goshozan A high sided helmet in which the back is higher than the front. Translates to "Rear Mountain Victory". Gumbai A non-folding style of fan often used to signal troops. Gunsen A folding war fan. Guru-wa A type of protective neck armor. Gusoku A complete set of armor. Gusoku bitsu A box for the storage and transportation of armor. Hachi The bowl of a helmet in which the rests upon the head. 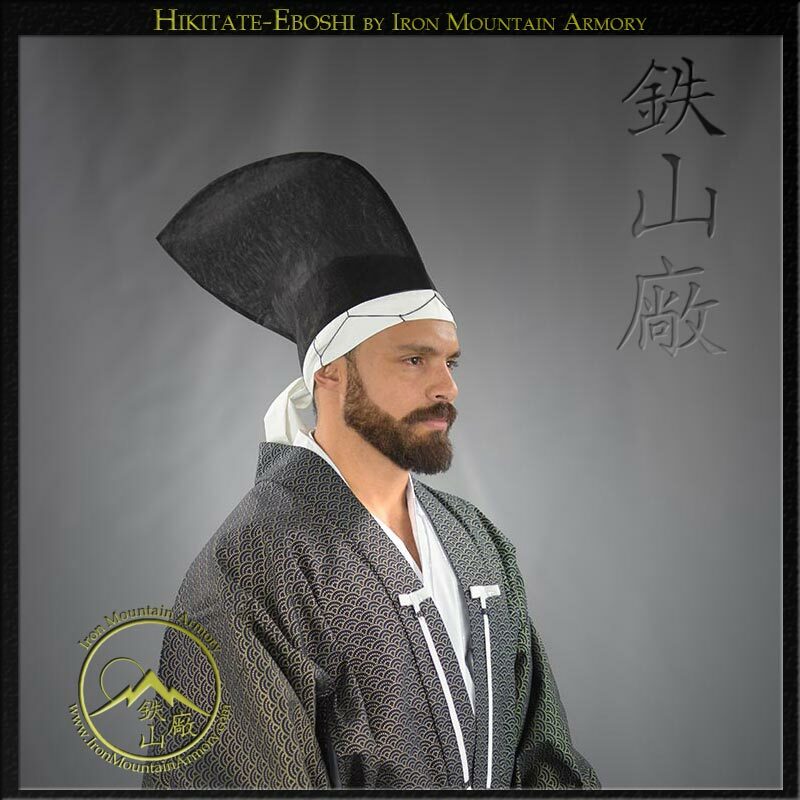 - Often Referenced by Iron Mountain Armory as "Simulated laminated helmet"
Hachigane Also written "Hachi gane" is an armor that protects the forehead, aka an armored headband. Hachiman za An alternative name for a tehen no kanamono. Himo The cords or straps that are used like a belt to tie the hakama, haidate or kyahan, for example. Hachi tsuke no ita The uppermost plate or row of scales in a shikoro. Haidate An apron shaped defense for the thighs. Haku hatsu men A mengu with a disheveled ago hige, designed to look like an unkempt old man. Hana A nose, specifically on a mengu. Hanagami bukuro A pouch attached to the front of a dō or behind one of the gessan. Hanbo A mengu that covers the chin and lower cheeks only. Happuri An upside down "U" shaped armor plate tied to the forehead that extended down onto the cheeks, protecting the outer face. Haraidate dai A tubular crest holder that is attached to the center of a helmet peak. Haramaki Armor worn during the Muromachi period which opens down the centre line of the back. grafted to objects such as kabuto bachi in order to transform the item’s. superstructure of wood, asa, paper, leather and lacquer. Hatomune dō A dō with a medial ridge. Heichozan A high sided helmet with a relatively flat apex. into the surface or applied in lacquer. Hineno jikoro A close fitting neck guard with a lower edge that is shaped to the shoulders. longitudinal plate being overlaid by a brow plate and peak combination. Hiro sode A shoulder guard which widens and flattens towards the bottom. contrasting color. - Referenced by Iron Mountain Armory as "Horizontal Accent Lace"
Hishi nui no ita The lowest row of scales or plates on a piece of armor. 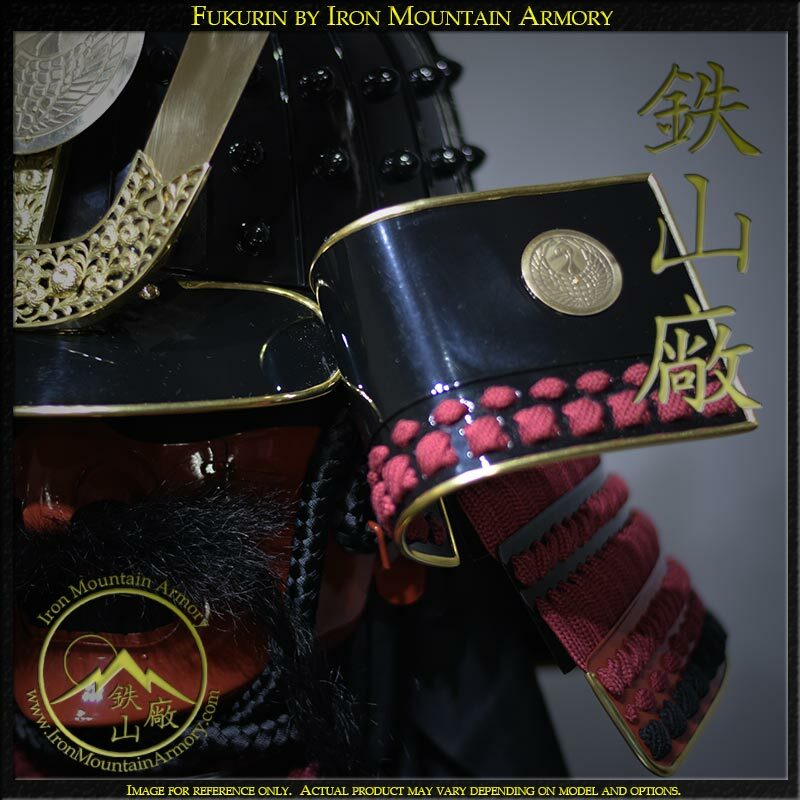 - Referenced by Iron Mountain Armory as "Accent Plate"
Hishi nui dō Plates that are merely decorated with cross knots, they are actually riveted (all types). Hishi toji A cross knot used on any but the lowest row of scales or plates. 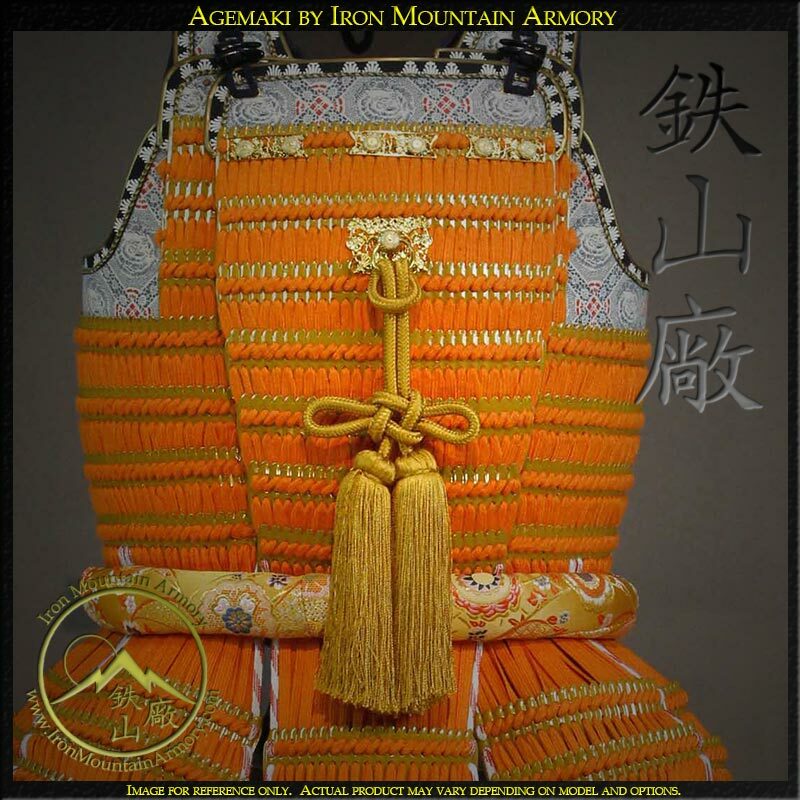 - Referenced by Iron Mountain Armory as "Main Lace"
Hishi toji dō A type of yoko hagi okegawa dō in which the plates are connected by cross knots. Hishi toji hotoke dō A smooth faced dō, decorated by cross knots. plates that extended over the front of the head. Hitsu A box for storing armor. Also known as Yoroi Bitsu and Gusoku Bitsu. Hoate A mask without a nose, that covers the face below the eyes. Hodo haidate Haidate that have the lower part of the armored portion divided into pendant sections. zane style. Literally translates as ‘real’ iyo zane. Hoshi bachi A helmet bowl with prominent rivets. Ichi no tare The top plate of a shikoro. Igaki Ornamental plates around the base of a helmet bowl. Ikeda Small raft like plates set in chain mail. Ikada haidate Mail haidate with scattered ikada. Inome A heart shaped aperture, commonly incorporated into the decorative design of an armor’s component parts. Translates as ‘boar’s eye’. Iro iro odoshi Multi colored lacing. Ishime An irregular, rough texture, like the surface of a stone. - This is what Iron Mountain Armory refers to as "Nami". Ita mono A solid iron or rawhide lame of armor plating. A single plate. Ite jikoro A tosei shikoro in which the right fukigaeshi can be removed or folded back for archery. Iyo-zane do A chest armor of over lapping scale plates that wrap around the body and fastens under the right arm. Jinabaori A samurai surcoat worn over armor. Jingasa a battle helmet, often conical in shape, worn by Feudal Japanese foot soldiers and samurai. Kabuto A style of combat helmet worn by the samurai. Kabuto Bachi A helmet bowl. Kabuto Bitsu A box designed to hold a samurai helmet. Kabuto no o The tying cord of a helmet. Kachi A Feudal Japanese foot soldier. Kaihan suneate Suneate without knee guards. Kake o A length of braid fastened to the upper edge of a mask that tied it to the head. Also refers to the front tying cord of a sode. Kami shimo A ceremonial dress of stiffened hemp, worn by samurai during the Edo period. Kara boshi A large rivet with a hollow head. Kara kozane Scales embossed from the back. Karuta gane do A folding armor of rectangular plates. Kasa byo A rivet with a flattened hemispherical head. Kasa jikoro A hat shaped shikoro that is almost horizontal. Common on Muromachi helmets. Kasa jirushi no kan A ring at the back of a helmet, designed to carry a small identification flag or, on later helmets, an agemaki bow. 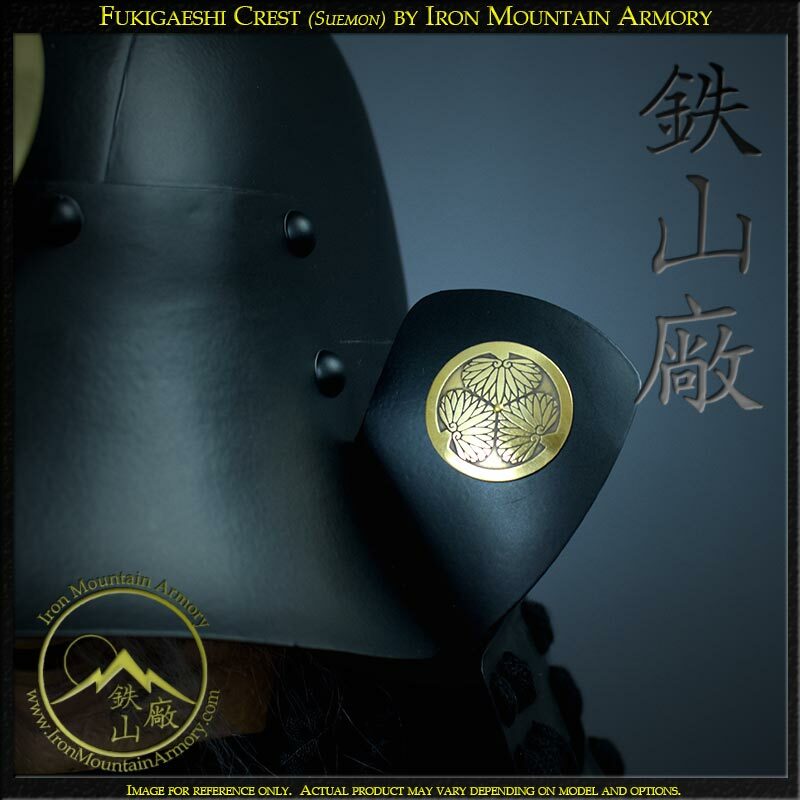 Kashira date A crest mounted on the top of a helmet. Katahagi nui do A do modelled to resemble a torso, with left shoulder and breast uncovered. Kawa fukurin A narrow band of leather used as an edge trim. Kawa koshi tsuke A leather belt used to attach a gessan to a do, usually held into place with leather or silk ties. Kawa shiki A rawhide thong to which iyozane are laced to hold them in rows. Kawa zutsumi do A do covered with a sheet of leather. Also known as a "Gawa Do"
Kawari bachi A helmet bowl of unconventional shape. Kawari haidate Haidate of s-shaped scales that are overlapped like roof tiles. Kawari kabuto A kawari bachi fitted with a shikoro to form a complete kabuto. Kebiki odoshi Closely spaced lacing, also known as "full lacing". Ken A term used to describe the number of tate hagi no ita (plates) used to make a hachi. Kikko A type of brigandine consisting of small hexagonal plates quilted between layers of fabric. 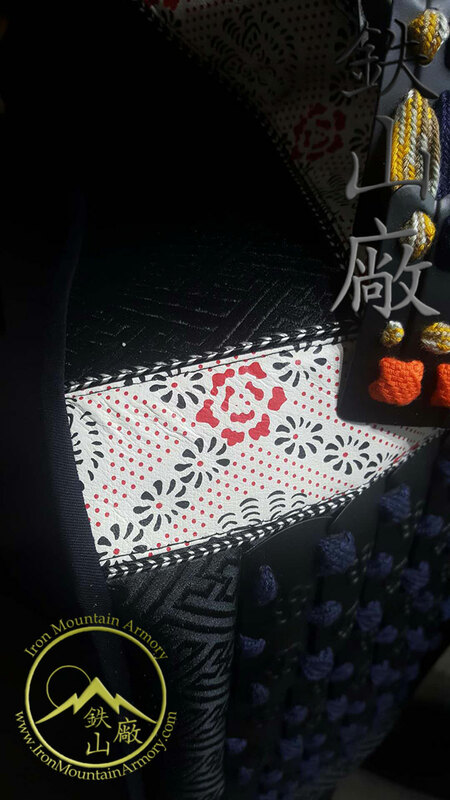 Kikko do A do made of hexagonal plates quilted between layers of cloth. Kikko gane Small hexagonal pieces of iron or rawhide, sewn to or between layers of cloth to create a form of brigandine covering. Kikko gane do A folding do made from hexagonal plates. Kiri take nari A helmet shape like a short length of bamboo. Kiritsuke iyo zane Iyo zane simulated by lacquer or embossing to a solid plate. Kiritsuke ko zane Ko zane simulated by lacquer or embossing to a solid plate. Kiwame fuda A certificate attributing the authorship of an armor to a particular maker. Kobakama Abbreviated trousers worn under tosei do armor. Kobakama jitate Thigh armor that is sown onto a pair of trousers. Koberi gawa Narrow bands of e-gawa that were used to trim the outer edges of larger surface areas of the armor. Ko boshi Small bullet tip shaped rivets. Ko boshi bachi A helmet bowl with small, standing, external rivets. Kogai kanamono A decorative plate and ring combination attached to the rear edge of a shoulder guard, to which the rear most tying cord is fastened. Kogake Armor for the feet. Kohire Winglets connected to the watagami of a do. Ko manju jikoro A small rounded neck guard. Komori tsuke An intermediate band of leather used to connect a tare to a mengu. 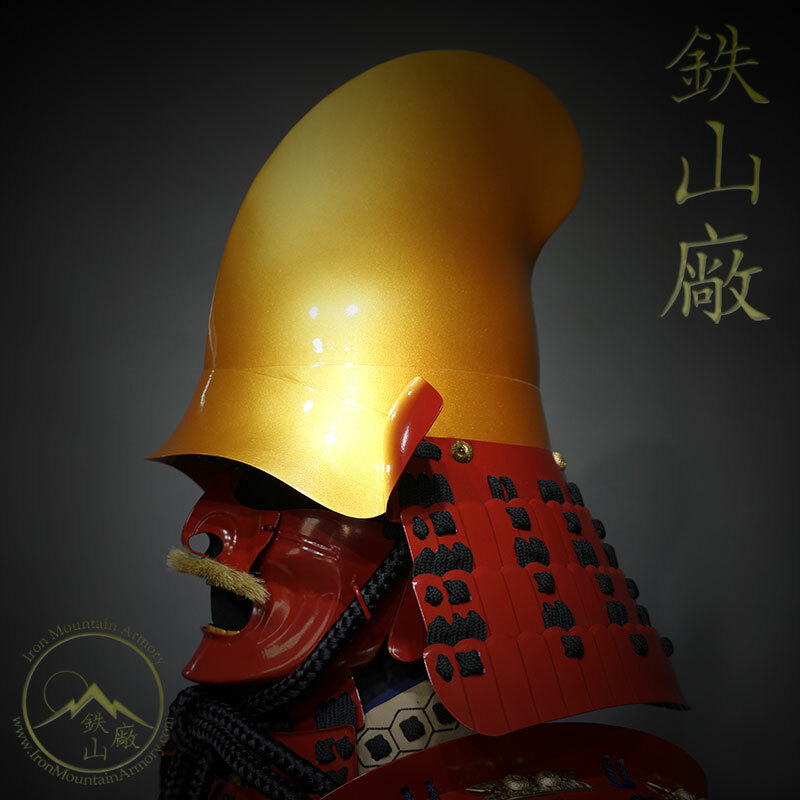 Koseizan A high sided helmet, usually flat on top, whereby the profile is taller than the hemisphere. Translates as ‘high sided mountain’. Koshi gusari Mail that has rectangular spaces to increase flexibility, especially on the inside of the elbow. Ko-zane A small narrow plate shaped like a scale. Ko zane gashira The top edge of an iyo zane, cut to resemble two ko zane. Kuchi hige A simulated mustache. Although they were generally made using animal hair, they could also be etched into the surface, or applied in lacquer. Kuro urushi nuri A black lacquer finish. Iron Mountain Armory refers to this as "Black Glossy"
Kusari Iron mail, often butted mail. Kusari do A mail and plate do. Kusari do maru A mail and plate do maru. Kusari gote A mail and plate kote. Kusari haidate A mail and plate haidate. Kusari haramaki A mail and plate haramaki. Kusari suneate A mail and plate suneate. Kusugai do Yokohagi okegawa do in which the plates are joined by a variety of staples. Kutsu Stiff boots or shoes of fur. Kuwagata Flat, stylized horns or antlers, worn as a frontal crest. Kuwagata dai A shallow, u-shaped holder on the tsuke mabizashi of a helmet bowl, designed to mount and display a pair of kuwagata. Kyahan Also written "Kaihan" are cloth leggings that wrap around the shin to hold the pant leg to prevent snagging of underbrush and/or while wearing suneate. Kyahan suneate Suneate without knee guards. Kyubi no ita Defense for the left armpit, worn with o yoroi. Kyubi A plate which protects the left chest area of O-yoroi. Lamellar Layered armor plates. Often the plates are overlapping like roof shingles. Mabizashi The peak of a helmet. Machi uke The socket at the waist on the back of a do, into which the sashimono assembly is fitted. Maedate A crest or decorative fitting mounted on the front of a helmet. Maki e do A do decorated with a lacquered design or picture. Manchira A type of padded vest with kikko plating sewn between the material layers. Manju wa A short, armored waistcoat worn beneath an armor to protect the armpits and upper chest. Maro do A tosei version of the do maru, differing from the original versions of the armor in that they have an extra row of scales in the naka gawa. Maru bachi See daienzan bachi. Maru do yoroi A hybrid armor between an o yoroi and a do maru. Mei The signature of a master katchu shi, engraved or lacquered on an item of armor that they, or one of their protégé had produced. Translates as ‘name’. Mei no ana A slit in the lining of a helmet through which the signature can be read. Men no shita men A face mask covering the face and nose from below the level of the eyes. Could also be referred to as men no shita bo (face below the eyes). Menpo An alternative and abbreviated term for men no shita men. Miage shiwa Simulated forehead wrinkles. Midzu nomi no o A cord that secures the sode to the age maki bow of a do from the kogai kanamono. Mimi Purely decorative ear shaped plates present on some mengu. Mimi ito Braid around the outer edges of a piece of armor, often variegated. Mimi no ana The small holes in the mimi that simulate the opening of the ear canal. Mino A cape woven from palm worn over armor, designed to protect armor from the elements. Mizu nomi no o Cord attached to the rear edge of a sode. Mogami do A do of horizontal plates, each of which is articulated by separate hinges. 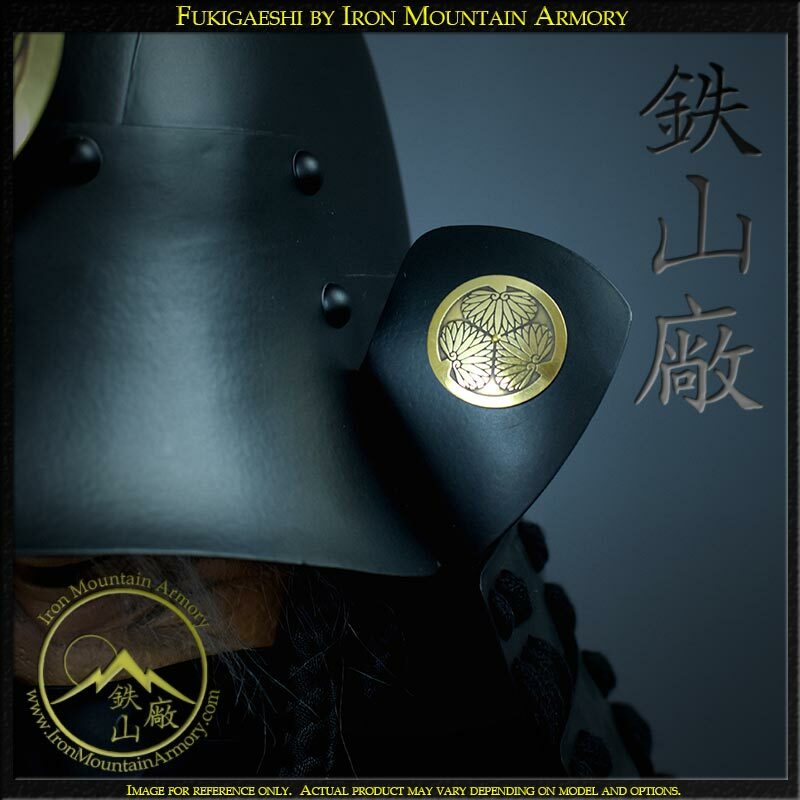 Momonari bachi A pointed helmet that has a medial flange inspired by a European cabasset. Muku boshi A rivet with a narrow pointed head. Muna ita The uppermost plate on the front of a do. Muna tori hotoke do A smooth faced do with a laced top section. Muna zuri no ita The lowermost lame of a tare. Translates as ‘chest sliding plate’. Refereed to as "Tare Accent Plate" by Iron Mountain Armory. Muromachi Circa 1333 to 1573. Corresponds with the reign of the Ashikaga shoguns. Namazu o kabuto A tall, laterally flattened helmet with a rounded profile, said to resemble the tail of a catfish. Nambokucho Circa 1336 to 1392. Corresponds with the conflicts between the northern and southern branches of the imperial court to establish themselves as the legitimate line. Nami gata An item made with an undulating wave like shape. Nanban gusari International style mail in which each link is meshed with four others. Nanban kabuto A helmet of European manufacture, or one inspired by a European prototype. Nanban kiri gane Small , decorative, cut metal pieces applied to the surface of an armor that was influenced by foreign designs and made in non-traditional Japanese shapes. 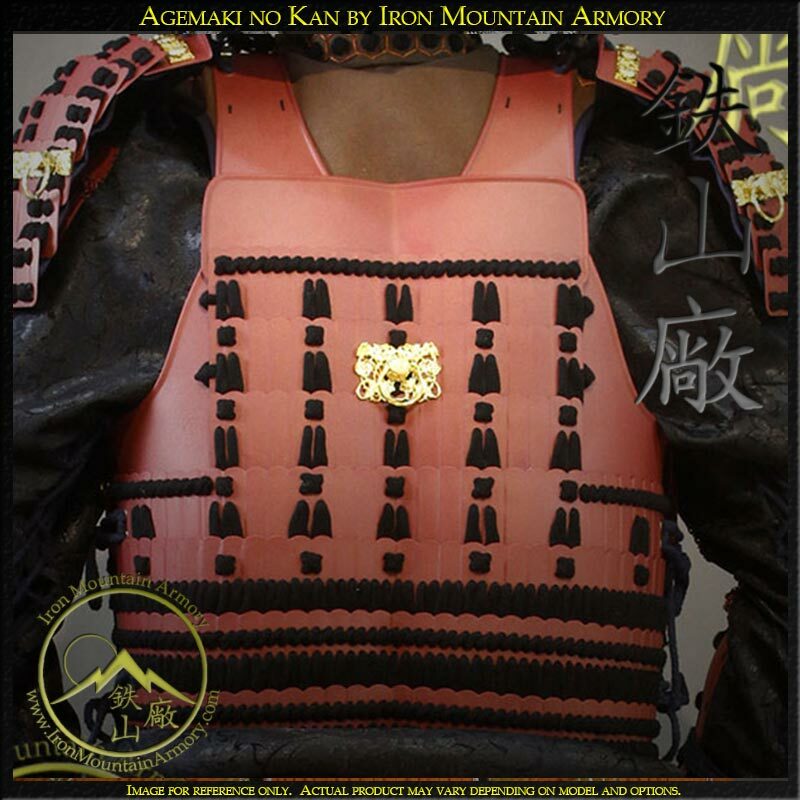 Nanban yoroi A foreign made piece of armor. Nawame fukurin A roped fukurin copying the edging of European armours. Neri gawa A single layer of rawhide, generally horse or ox hide, or several layers secured together with adhesives. Ni-mai do (Nimai) A do in two parts, joined by a hinge under the left arm. Nio do A do modelled to represent the human torso. Nodowa A bib like defense to protect the throat and upper chest, consisting of of a u-shaped plate with two or three curved rows of scales attached to it. Nuinobe do A sugake laced ni mai do, made of iyo zane. Obi A belt or sash. O boshi A rivet made with an over-sized head, used for decorative purposes. Oda gote Kote with gourd shaped plates applied over the forearm and upper arm. Oda haidate Haidate of mail, with ikeda and knee plates resembling those at the elbow of oda gote. Oda yori gane, or Yadome A pair of erect flanges that fasten diagonally across the cheeks on some examples of mengu. Oda yori kugi A pair of erect posts fitted to either side of the lower jaw of a mengu, used to anchor the shinobi no o of a kabuto when tying the helmet in place. Oda yori no kan A pair of metal rings attached to both cheeks of a mengu, through which the shinobi no o (helmet rope) of a kabuto are threaded when tying the helmet in place. Oda yori ore kugi A pair of sturdy l-shaped posts set into both cheeks of a mengu, used to anchor the shinobi no o of a kabuto when tying the helmet in place. Odoshi ge Lacing material, silk, leather, hemp or cotton twill. 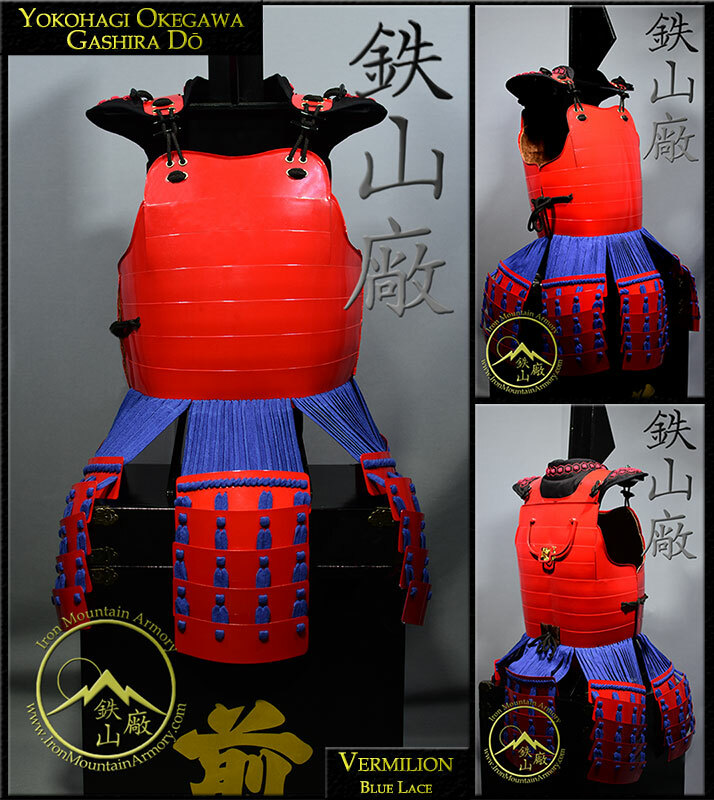 Okashi gusoku Armor issued to low a ranking soldier, usually of low quality. 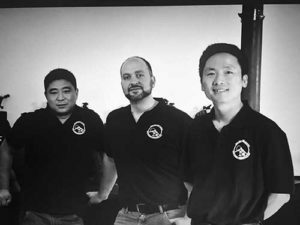 Refereed to as "Kachi Class" by Iron Mountain Armory. Oki tenugui bachi A helmet bowl with almost vertical sides and top plates which are extended rearwards, beyond the back of the bowl. Omodaka do A do with a metal ridge. Oni damari no ita The turned out upper edge of the muna ita, designed to deflect spear or sword thrusts. Oni gashira An item with a demon like face or facade. Ori kugi A hook on the cheek of a mengu, around which the helmet cord is fastened. O sode A large, rectangular sode. O tateage suneate Shin guards with large standing plate defenses for the knees. O yoroi A lamellar armour that has a separate defense for the right side of the body, classic of the Heian period. Renjaku do A tosei do fitted with internal suspensory cords. Ressei men A mengu with an aggressive looking expression and prominent facial wrinkles. Ressei men no shita bo The most typical type of men no shita men, made in the ressei style. Roku mai do A tosei do with five hinges that is divisible into six sections. Ronin A samurai warrior without a master. Ryo takahimo A tosei do in either two or six sections, with ties at each side of the body. Ryubu men A mengu with a calm, noble expression devoid of any facial wrinkles. Sabi nuri A lacquered surface imitating rusty iron. Referred to as "Brown Suna" by Iron Mountain Armory. Saihai (Sai Hai) A commander’s baton hung with a tassel of hair, leather or paper. Sai han no kan A ring on the right breast of a tosei do. Saiga bachi A type of multi plate helmet made in the distinctive Saiga style. The term can refer to any bowl made in Saiga but is most commonly used in relation to a helmet bowl topped by a number of large chrysanthemum shaped plates. Sane An individual scale of either iron or rawhide, from which lamellar armour was made. Sane ita A lame assembled from individual sane bound together. San ju hachi ken Used in conjunction with other terms to describe a hachi that has been assembled from 38 tate hagi no ita. San ju ni ken Used in conjunction with other terms to describe a hachi that has been assembled from 32 tate hagi no ita. Sangu The term for the three samurai armor parts / components that protected the extremities of the samurai class of feudal Japan. The Sangu armor included the kote, haidate and suneate. Sanko no byo Dome headed rivets that attach the peak to the bowl of a hachi. Saru bo A v-shaped hanbo with indented cheeks that partially frame the upper outline of the mouth. Translates as ‘monkey cheek’. Sasa heri Leather or braid edging around the fabric portion of an armor. Sasa mayu A type of simulated mayu with sharp pointed features that resemble the shape of bamboo leaves. Translates as ‘bamboo leaf eyebrow’. Sashimono An ornamental device attached to the back of an armour, often a flag. Sashimono dome no ana Small holes in a haraidate dai in which to insert pins that lock a maedate in position when the latter is mounted on a kabuto. These often go from side to side. See also, hirame. Sashinuki gote A pair of kote that form part of a small jacket. Sendai do An alternative name for a yukinoshita do. Shikoro The neck guard of a helmet. Shino A splint or long narrow strip of metal plating. Shinobi no o A helmet cord. Shino gote Kote with splints over the forearm, sometimes connected by mail. Shino haidate Haidate that consist of splints connected by mail. Shino suneate Shin guards that consist of splints connected by mail. Shishi A mythical Japanese “lion-dog” creature, representations of which, are often found to be incorporated into fabrics and items of armor. Shitagi A shirt like garment worn under armor. Sode tsuke no o The fastening cord of a shoulder guard. So fukurin Decorative moldings that fit over the suji tate of a hachi, anchored in place by the tehen no kanamono on the top of the helmet and by the higaki around its lower rim. So gusari Mail in which each circular link is connected to four others, ie the normal Japanese construction. (So-men) A mask that covers the entire face from the top of the forehead to the underside of the chin. Sueomon An heraldic crest applied to the surface of a fukigaeshi. Sugake odoshi A lacing technique in which pairs of laces are threaded vertically, up a row of scales and cross knotted before being connected to another section. Translates as ‘simple hang’. Suji A rib or flange. Suji bachi A multi plate helmet in which the rivets are countersunk, leaving the flanged edges of the plates prominent. Suji tate An erect flange, fitted along the vertical edge of a tate hagi no ita at a 90-degree angle to the facing surface of the plate. Suji tate bachi A conventional hachi made using tate hagi no ita with a suji tate. Sumi zukin nari bachi A type of kawari bachi made to resemble a cloth tied around the head whereby the loose end lies towards the rear of the head. Suneate A shin armor / guard worn by samurai. Suso no ita A general term for the lower most lame on a item of armour such as a shikoro, sode or tare. The lower lame of a shikoro is generally referred to as the kata zuri no ita. Reffered to as the "BOTTOM / ACCENT PLATE" by Iron Mountain Armory. Tabi traditional Japanese socks dating back to the 15th century. Commonly ankle-high and with a separation between the big toe and other toes, they are worn by both men and women with zori, geta, and other traditional thonged footwear. Tachi do A do sufficiently long in the body to rest on the hips. Tameshi gusoku Armour showing the marks of bullets used to test its defensive quality. Tanko Early plate armour of the Yamamoto period. Tare The throat guard to a mask. Also a protective apron, found for example, on kusari do. Tataki nuri A unique lacquer finish that features a raised relief rippled texture. Reffered to as "UZUMAKI" by Iron Mountain Armory. Tatami do A folding do. Tate hagi okegawa do A tosei do made of vertical plates. Tehen The hole in the crown of a helmet bowl. Tehen no kanamono An ornamental metal surround, made up of one or more za that are stacked on top of each other over the tehen and anchored in place by the tama buchi. Tekko A plate covering the back of the hand which forms part of the kote. Tenkokuzan A high sided helmet in which the top dips in the area of the tehen. Tenugui no kan The ring on the left breast of a tosei do. Tetsu sabiji A lacquer effect that simulates rusty iron. Referenced to as "TETSU NAMI" by Iron Mountain Armory. Tokoro kebiki odoshi Closely spaced lacing that is strung in channeled rows, with open vertical breaks between the laced areas that create an alternating pattern of laced and unlaced strips. Toppai bachi A pointed helmet bowl. Those with convex sides are called shii nari or ‘acorn shaped’. Tosei do A ‘modern’ do that evolved during the sixteenth century. 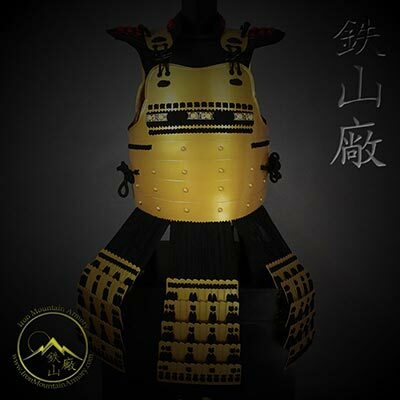 Tosei gusoku A ‘modern’ armor fabricated from the late fifteenth century onward. Tosei sode A small ‘modern’ sode hanging from the fastenings of the kote. Tsubame bo A v-shaped hanbo that covers the cheeks and lower jaw. Tsubo sode A sode that is curved towards the arm and narrows towards the bottom. Tsuru no kubi A fitting used to mount a maedate to a haraidate dai of a kabuto. Translates as ‘crane’s neck’. Tsutsu gote Kote in which the plates over the forearm are hinged or sewn to each other. Tsutsu suneate Shin guards in which three or more plates hinged or sewn together. Tsuyu otoshi no kuda An extended pipe-like fitting set into the underside of the chin on face mask which allows perspiration to drain away. A variation on the ase nagashi no ana. Uchi dashi do A tosei do decorated by embossing. Uchi dashi mayu Embossed eyebrows on a kabuto or so men. Ue ba Simulated rows of teeth in the kuchi of a mengu. Ue ge Simulated areas of hair on an item of armor such as a mengu. Uke o A cord that secures the top of a sode to an age maki bow on a do. Uke zutsu A wooden socket into which the sashimono pole is fitted. Ushiro date A crest fitted to the back of a helmet. Uwa obi Outer sash or belt. Refereed to as "SARASHI" by Iron Mountain Armory. 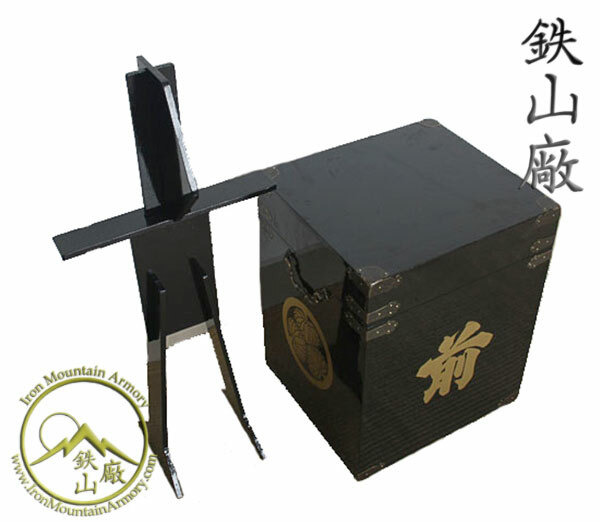 Waidate A piece of armor that forms part of an o yoroi and guards the right side of the body. Waka ita Plates attached to the upper edge of the naka gawa, under the arms. Wakibiki An arm pit guard, often crafted from kikko or tatami style armor. Waki date Crests or similar decorative features fitted to the sides of a helmet. Waki date tsunomoto Erect prongs fitted to both the left and right sides of a helmet, upon which to mount waki date. Waraji sandals made from straw rope that in the past were the standard footwear of the common people in Japan. Waraji were also worn by the samurai class and foot soldiers during the feudal era of Japan. Washi Japanese paper, generally made from the bark fibre of gampi trees but also from bamboo, hemp, rice and wheat. Watagami The shoulder straps of an armor. Yokohagi okegawa do A tosei do made from horizontal plates. Yoroi A term for armor worn by samurai. Yoroi hitatare A specific style of clothing often made from a brocade, worn under armor. Yukinoshita do A go mai do of solid plates with external hinges popular in Sendai. Zenshozan A high sided helmet that is higher at the front than the back. Zu date A crest or other form of decorative feature fitted to the apex of a helmet (see also kashira date). Zukin An armored hood often made with plate armor connected by chain-mail. Zukin nari kabuto A type of oki tenugui kabuto. Zu nari bachi A head shaped helmet bowl, generally assembled from five plates, with a distinctive longitudinal top plate that extends front to back over the center of the head.